Ritesh Jaiswal from Allahabad, B.Sc Graduate. Ritesh Jaiswal is BIOINFORMATICIAN and currently have no work experience. PERL BASICS LINUX MODEL AND SIMULATION.. ZOOLOGY BIO INFOMATICS BIOINFORMATICS MOLEC..
are one of expert skill area's of Ritesh Jaiswal . 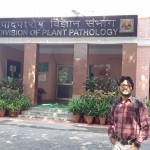 Ritesh Jaiswal is working in Bio Technology industry.